What Pascal brand&model card are you crunching with? 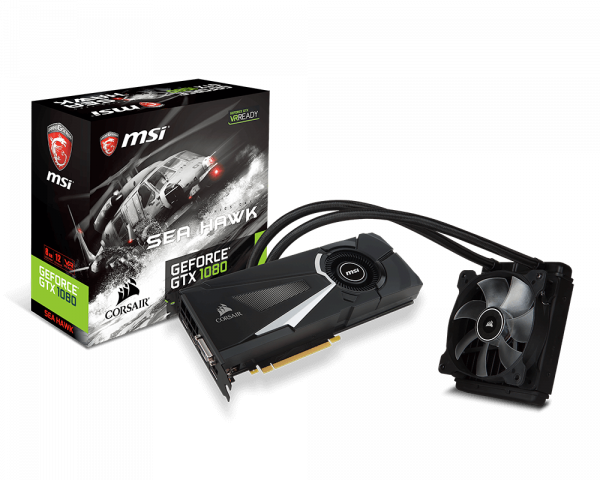 Message boards : Graphics cards (GPUs) : What Pascal brand&model card are you crunching with? Please provide the full model name to make possible to identify it. I mean not just "EVGA/1080" but EGA/1080 GTX 1080 SC GAMING ACX 3.0 for example. Any additional comment on your experience with the card: noise, boost, temperature will be of course welcome. I have switched from MSI to Palit/Gainward as they provide the most efficient and most silent Pascal cards at present. Whatever Palit or Gainward card you choose, they all have huge heat sinks and therefore need a lot of space, one triple slot per GPU. I have one Palit Gamerock GTX 1080 (Non-Premium) which is just a mild OC and runs stable at full load at 66°C ... all around the clock. Product code is NEB1080T15P2-1040G. If there is a good offer, you could take the equivalent Gainward too, as they are widely identical. The Phoenix is the mild OC (=equal to the Gamerock/Jetstream) whereas the GS and GLH utilize much higher clock rates (=comparable to the Gamerock Premium and Super Jetstream). I would love to see HCF1 protein folding and interaction simulations to help my little boy... someday. Some noise that could be annoying from water pump but not bad. Temp are good have reach at max 55 Celsius. AOI and blower do work fine and low noise even with 90% to blower fan, i manage to get same clock as Gigabyte and would be max clock with boinc projects. Both get hot backplate so i have attached a separated fan to cool down feed and cool down the card. temp are good at 40-55 at normal work. Two throw in my two cents. Pascal is generally a good choice because of power efficiency. There is no disastrous board partner design on market, so you cannot do anything wrong with buying a GTX1080. My suggestion is to let purpose, individual preferences and available space decide. See the below review (German only) from Computerbase (comparison of a few air-cooled custom axial designs). In brief … the reviewed models of Palit, Gainward, Gigabyte and Inno3D have about the same power efficiency. But four “outliers”, the ZOTAC, the ASUS, the MSI and the EVGA. One outlier to the low end is (to my surprise) the EVGA FTW which needs 20-30W more power than the center span, produces more heat (up to 80°C full load) and is still not very silent or fast. The MSI Gaming X is also somewhat inefficient and even slower than the EVGA, most likely due to the lower clock rates. As a result, the temperatures are slightly better after all. Both the MSI and the EVGA are no bad products … but do not really sound like perfect crunching cards to me. For all I know, EVGA utilizes the genuine Nvidia PCB, whereas ASUS (and some other board partners) modify it or even use own designs. That is a fact you can observe in the reduced power draw. The Zotac AMP! Extreme seems to be the card if you want to play games and crunch just now and again. It is long, bulky, heavily overclocked and pulls 40W more than the Palit/Gainward but is just slightly faster. Fortunately the heatsinks do a good job, the card is relatively silent. Anyway, that low efficient configuration doesn’t make much sense for crunchers at a first view, having said this, things could look a Little better when you lower the clock of the Zotac. Unlike the MSI, the Zotac has a lot of down-clocking potential. The ASUS Strix OC is the outlier to the high end, the most power efficient card in the review, a superbly modified ASUS board, low temperatures, at first view it’s the perfect crunching card. But alas … it is somewhat loud. Twice as loud as the winning Palit/Gainward. But probably can be improved by choosing a different fan profile, increasing the operating temperature a little. From the Computerbase review, the Gigabyte G1 Gaming and Inno3D iChill X3 are well balanced cards with a few weak points. The graph shows that the Gigabyte default configuration is not as power efficient as the ASUS - but a little quieter. The Inno3D on the other hand, performs well, is even less noisy than the Gigabyte, but is a true hothead! (82°C) As it doesn’t have the down-clocking potential of the Zotac, you could only increase the fan speed of the Inno3D, leading to more noise. Finally, the Palit and Gainward are for people (like me) who run the cards 24/7 and even sleep nearby their machines. They are very fast (2nd place in the review), most silent (33dB) and maintain low temperatures as well. That is something I can confirm and do appreciate. The only real CONs are their bulky heatsinks. So if you don’t have the three slots, the ASUS or Gigabyte would be my next choices. Well, the above is just a summary of the Computerbase article and therefore not a perfect match to real world conditions. Therefore it would be interesting to read some reviews of owners of the above cards and their experience. Message 45076 - Posted: 31 Oct 2016 | 19:05:24 UTC - in response to Message 45068. ... They are very fast, most silent and maintain low temperatures as well. The only real CONs are their bulky heatsinks. There are no wonders in cooling: the larger the heatsink, the lower the temperature will be at a given power output; therefore two slot cards (with axial fans) will be always louder and / or hotter than 3-slot cards. I have good experiences with a Zotac GTX980Ti AMP Omega, and an ASUS Matrix Platinum GTX980Ti. I prefer the Zotac's fin alignment: in which the heatpipes are parallel with the length of the card, and the fins are parallel with the height of the card. (the ASUS Strix 1080 is using this alignment now.) In this way the hot air could be removed at the top of the card(s) by fans blowing outwards (upwards). The ASUS GTX980Ti Strix OC is loud. The Gigabyte Windforce GTX980Ti G1 Gaming is a bit better. About efficiency: an OC card will always be less efficient than a non-OC one. The overall power consumption of the card could be lowered by tweaking its PSU by applying more power phases than the standard, using FETs with lower switching time and Rds(on), using better capacitors. Lower working temperatures also lower the power consumption by a fraction. My Gainward GTX 1080 Phoenix GLH (Goes Like Hell) edition card is silent, but a WDDM OS couldn't utilize this card high enough. Hopefully I can make it work with Windows XP x64, then I will report back. Message 45080 - Posted: 31 Oct 2016 | 20:11:11 UTC - in response to Message 45076. Correct, the 2-slot has to use a higher flow rate in order to remove the same heat quantity from the (smaller) cooling fins. About efficiency: an OC card will always be less efficient than a non-OC one. The overall power consumption of the card could be lowered by tweaking its PSU by applying more power phases than the standard, using FETs with lower switching time and Rds(on), using better capacitors. yes.. and parasitic capacitances in general as to the passive components but also the print layout, if I may add that to your list. That's the reason why an architecture shrink is faster than its predecessor, a scale down simply reduces capacitances and improves slew rates. Lower working temperatures also lower the power consumption by a fraction. One question more, are you running one or two wus per GPU? Message 45096 - Posted: 1 Nov 2016 | 15:00:32 UTC - in response to Message 45093. I run two per GTX 1070 or 1080... but that is a habit from Poem in order to utilize the GPU to >90% making sure it gets sufficient CPU support per task. It worked perfectly there, however I did not manage yet with GPUGRID neither with short nor with long runs. Zoltan, what utilization do you have on your 980ti? Do you observe any load oscillations? Message 45103 - Posted: 1 Nov 2016 | 22:32:19 UTC - in response to Message 45101. It depends on the workunit, but usually 95-96%, ±1%. Strange. My 1070 does not get better than 90% and the 1080 is even worse, maybe 75%. No matter how many tasks and the CPU/GPU ratio. As if the algorithm is not yet Pascal optimized. But this gets off topic a little... maybe I should bring that question forward somewhere else. Message 45111 - Posted: 2 Nov 2016 | 12:57:18 UTC - in response to Message 45104. A Pascal Settings and Performance thread would be useful to discus such matters. Message 45113 - Posted: 2 Nov 2016 | 13:20:39 UTC - in response to Message 45104. FWIW my 1060 runs @ 95% with 2 tasks at a time at stock settings. What's truly amazing is that according to my UPS it's only pulling 45 watts. Back on Topic. Unless I am mistaken, Trotadors question was which Pascal card(s) do we use ... but he did not specifically ask for a 1080. From price and price/performance ratio I assume that the 1060 6G and 1070 8G will be more popular anyway in the long term. Are there any other crunchers who can comment on their experience with 1070, 1060 or even 1050ti cards? In theory the smaller cards should have a relatively good utilization. Comments welcome. Message 45137 - Posted: 3 Nov 2016 | 12:27:40 UTC - in response to Message 45133. Should get a GTX1060-3GB tomorrow, and will probably replace a GTX970 with it in a Linux system to generate some sort of early like for like performance comparison, if possible; it's difficult with tasks performing so differently. (The cheapest dual fan model I could get). In the UK the 3GB 1060's are presently the best bang for buck (for here); £190 compared to £240 for the 6GB version. So 10% less theoretical (1152 vs 1280 shaders) performance for 26% cheaper. The GTX1050Ti's are basically a paper release as far as the UK is concerned - none in stock. At £140 they are decent value for money at the entry end, and being 14nm might perform very competitively (if you can get one). There are a few GTX1050's & £120 is comparable value (performance/price) against the £140 Ti version, but I expect most would want the larger version (768 shaders vs 640). The cheapest GTX1070 is £395, but that's more than twice the price of a GTX1060-3GB which has 60% the theoretical performance. When you factor in scaling and bus width per core config the 10603GB wins hands down (in terms of performance/price, taking nothing else into consideration; such as the whole computer cost, or possibly higher cache amounts on some models). The GTX1080's are £600 upwards, and not suited to 2GHz entry level CPU systems or WDDM impacted Windows OS's. I installed an MSI GeForce GTX 1060 GAMING X 6G just a week ago. The PC(Win10x64) runs one WU of GPUGRID and a couple of atlas@Home WU's. The card never gets any hotter than 60-65° C and the cooler is so silent I can't even hear it (666rpm usually). The load on the card typically hovers around 60%. Power draw according to hwinfo is 63W. As for performance, GPUGRID doesn't really offer any good insight into that, or I haven't found it. But I can tell you it's a whole lot faster than my GTX760 :). Message 45176 - Posted: 4 Nov 2016 | 15:19:38 UTC - in response to Message 45166. The load on the card typically hovers around 60%. Power draw according to hwinfo is 63W. For all I know there is no magic bullet yet to correct that. Rather a mix of many influencing factors. It has a huge 3 fan cooler for a 120W card. It's whisper silent. In a colder room, the fans turn off even during full load. At 22C ambient the card runs at 54C, fan speed is 28%. This is the only GPU I can run next to me without the noise bothering me. Build quality is very good, if you like flashy leds the design is unbeatable. I overpaid a LOT for this card (400$ in Hungary). A cheaper 1060 3G can be had for half this price. I could have bought a 1070 with just a bit more cash. I use the 375.70 driver, folding@home is broken, but GPUGRID runs like a dream! Points/day is around 400.000, utilization is 88-92%. Message 45194 - Posted: 5 Nov 2016 | 11:39:07 UTC - in response to Message 45113. Could you use HWinfo64 (https://www.hwinfo.com/download.php) to check your power usage and report it here? I'm curious, because according to that my 1060 pulls around 65W when only running at 60% load. HWinfo will tell you the GPU load, power draw, temperature and many other things. Message 45195 - Posted: 5 Nov 2016 | 11:42:29 UTC - in response to Message 45183. Same question as in previous post. Could you use HWinfo64 to report some numbers? I'd like to find out how you get the %usage so high, I can't get mine to go over 65%. I've finally purchased a Gainward Phoenix GLH as Retvari. I've installed it in an ubuntu 16.04.1 host substituting a 750Ti with a dual e5 2690 v1 CPU configuration (boost 3.3 GHz). I've left two threads unused out of 32 to make GPU crunching smoother, rest left cruching WCG now. So far the card uses to boost to around 2 GHz if card temperature is below 60ºC, which does not occur with the default fan profile setting. Set coolbits=12 to get only fan control, now set about 65%, driver 367.57 does not allow overclocking. Maximum GPU clock I've seen is 2042Mhz with a temperature of 40ºC. NVIDIA control panel shows the card in Performance Level 2 that puts the memory in 9524MHz, below default setting I think. The average ppd seems to be around 950Kppd except the 63750 points wu that gives much less. A co-worker got me into compute crunching after I splurged on a Titan X Pascal, pretty cool stuff. The BNBS WU's i'm doing now take about 6-7 hours depending on ambient temperatures, averaging about 1.2 M credits per day. I Macgyver'd a closed-loop watercooler onto it, so clock speeds stay well into the upper 1800 MHz's and temps hover around 50C. Usage is pretty much a constant 85%, so I imagine these runs aren't entirely Pascal-optimized yet. Both units are plug and play hybrid cooling, they run ~ 40-45 degrees under full load. I see the best results running 2 work units per card under GPUGRID. Message 46368 - Posted: 28 Jan 2017 | 2:59:56 UTC - in response to Message 46366. Message 46369 - Posted: 28 Jan 2017 | 5:17:46 UTC - in response to Message 46368. The blower cools the baseplate which sinks heat from the VRM and transistors. Previously the stock heatsink cooled the RAM chips around the GPU, but apparently GDDR5X uses much less voltage than chips of the past and doesn't get very hot. The plate is just cool enough to touch under full load, i'd say around 60C. Message 46374 - Posted: 28 Jan 2017 | 16:41:38 UTC - in response to Message 46366. ... on a Titan X Pascal ... The BNBS WU's i'm doing now take about 6-7 hours depending on ambient temperatures, averaging about 1.2 M credits per day. Usage is pretty much a constant 85%, so I imagine these runs aren't entirely Pascal-optimized yet. Well, these BNBS WU's are the most GPU utilizing tasks here at GPUGrid (I see 99% GPU usage on my GTX980Tis under Windows XP & SWAN_SYNC). You can optimize your system to such high-end card by applying the SWAN_SYNC environmental value to make the GPUGrid app to use a full CPU thread to feed the GPU. It is also recommended to crunch CPU tasks only on one CPU thread, or not crunch CPU tasks at all. Click on the Start button, paste and press [enter]. Look for the lower section called "System Variables", click on the [New] button below the list of System Variables. Exit BOINC manager with stopping scientific applications. Message 46375 - Posted: 28 Jan 2017 | 20:17:44 UTC - in response to Message 46374. Zoltan, how did windows XP work with your gtx 1080? Message 46376 - Posted: 28 Jan 2017 | 21:54:05 UTC - in response to Message 46375. The GPUGrid app v9.14 does not work under Windows XP, even if I hack the latest Windows XP driver to have my GTX 1080 installed under Windows XP. However I successfully used it under Windows XP with other projects (Einstein@home and SETI@home if I recall it correctly). While I'm using the x64 edition of Windows XP, it seems that the app thinks it's not an x64 OS, or it simply checks the version of the OS, and exits if it's under v6.x. Message 46816 - Posted: 3 Apr 2017 | 21:06:35 UTC - in response to Message 46374. Awesome, thanks for the tip. Saw a ~10% increase with that. One issue though, it seems the app won't use a full thread, at least not consistently. It'll very occasionally (for .5 secs every 2 mins. or so) spike to 91% on a single thread, but it hovers at 20-40% across ALL cores the vast majority of the time. Not sure if it's related, but my GPU still isn't fully utilized at 90% (although it is more so than before). How would I get it to run full-speed on one thread? Message 46817 - Posted: 3 Apr 2017 | 23:02:42 UTC - in response to Message 46816. One issue though, it seems the app won't use a full thread, at least not consistently. It'll very occasionally (for .5 secs every 2 mins. or so) spike to 91% on a single thread, but it hovers at 20-40% across ALL cores the vast majority of the time. This is how every modern OS distribute the workload across all available cores/threads. It has some risks to use only one core (thread) all the time, as that core will be hotter than the others, and in the long term it could reduce the lifetime of the CPU chip. Not sure if it's related, but my GPU still isn't fully utilized at 90% (although it is more so than before). It's related to the Windows Display Driver Model, which could not be turned off. The Intel(R) Core(TM) i7-4790K CPU has very advanced techniques to make the thread change of a process as "seamless" as possible. Start task manager by right click on the taskbar and then click on "task manager". Click on "more details" at the bottom if you haven't already done that. Click on the "details" tab, and look for the acemd.914-80.exe, right click on that and select "Set affinity". Then select as many threads as you want (an even-odd pair of threads resides on the same, single "core"). Message 47192 - Posted: 11 May 2017 | 4:40:58 UTC - in response to Message 46817. Been running my Titan X for a couple of nights now and am a little surprised it's been up to 1.8GHz when it boosts. Pretty impressive for the blower cooler on such a massive chip. Haven't seen too many WUs crunched within the 5 - 7hrs timeframe yet, but at least it's contributing to scientific achievements. Just replaced two Maxwell EVGA Titan X Hybrids with two EVGA 1080Ti SC + Hybrid kits. Works like a charm. The PC is in a closet, yet the GPUs don't exceed 50C for GPUGRID and 70C for PrimeGrid CUDA apps. Using 382.05 drivers. Speaking of which, there is a significant usage difference between GPUGRID and PrimeGrid. I have my cards set to 120% max clock and 85C max temp (using MSIAfterBurner), whichever comes first, and turns out, they are not the limiting factor. Should someone know about this at GPUGRID? Or is there a better forum to post this at? Message 47201 - Posted: 12 May 2017 | 22:47:17 UTC - in response to Message 46367. Iiiiinteresting... Care to share your app_config.xml? Message 47202 - Posted: 13 May 2017 | 0:46:23 UTC - in response to Message 47201. Message 47206 - Posted: 13 May 2017 | 16:36:53 UTC - in response to Message 47202. Just added an EVGA GTX 1080Ti FTW3. The host is here. I was previously running an EVGA GTX 1080 SC in that box but moved it to this host. The CPU is a slightly slower and I think my run times have consequently gotten a little longer.